The 2014 Los Angeles Auto Show is underway in Southern California at the moment. Google is showcasing their Android Auto software at the event. And of course, Apple CarPlay is there too. Multiple sources are reporting how the two technologies compare to each other. There are a lot of similarities in the way things work but obviously there are a few differences too. Edmunds.com has a nice piece on Android Auto posted last week. PCWorld has also covered the story from the LA Auto Show. Google's demo videos on YouTube are also a good source of information. Hyundai demoed Apple CarPlay in its 2015 Sonata earlier this year in New York and has followed that up with Android Auto demos in Los Angeles this week. There are two 2015 Sonatas set up at the Auto Show; one with Apple CarPlay, the other with Android Auto. Apparently, Hyundai is the only car company to demonstrate both technologies at the event. 1. Android Auto will work with Android 5.0 Lollipop: The in-car technology won't be limited by the type of smartphone you use, but by whether your smartphone runs Android 5.0 Lollipop - Google's latest mobile operating system. Similarly, Apple CarPlay requires iOS 7.1 or later to work. 2. Android Auto uses Google Now cards: While Apple uses Siri to stitch together all the functions in CarPlay, Google uses Google Now for Android Auto. If you're familiar with Google Now, you will like how Android Auto works. Android Auto puts safety first by using Google Now cards for easy access to various functions. The cards are smart and intuitive, making informed decisions based on what information you input into Google Now. Google's contextual search will be used to improve the whole experience. For example, if you ask about the weather in San Diego and follow that up with, "How late is the zoo open?" the system immediately knows you are asking about the San Diego Zoo and will show you a map of the area with business hours. It will even give you the option to navigate there. The other example was, having an appointment scheduled at a certain time and at a certain location would prompt the system to give you directions to that place. CarPlay does a similar thing with its Maps application. Within Maps you can click on 'Destinations' which pools address information from your messages and emails. Only information sent by people in your contacts list is used. 3. Get Vehicle Diagnostics directly from Android Auto: If using Android Auto on an OEM system in the car (not aftermarket), you get the option of viewing vehicle diagnostic information. This is the same information you would get if you used an OBD-II device and a smartphone app that connects to it. The diagnostics option is available when you tap the corresponding icon in the Android Auto menu bar. Although it is not known yet whether CarPlay will offer similar features in the OEM version, it seems highly unlikely at the moment. 4. Android Auto locks you out of your phone: Those of you who have used CarPlay will know that even when the software is in use, you are free to use your iPhone for other things. This is not the case with Android Auto. When in car mode, Android Auto locks your smartphone. You can't use other functions or apps while connected to an Android Auto system. According to Google, this is a safety feature as drivers are not supposed to fiddle with their phones while driving. But what if a passenger is using their phone for Android Auto? Tough luck! 5. 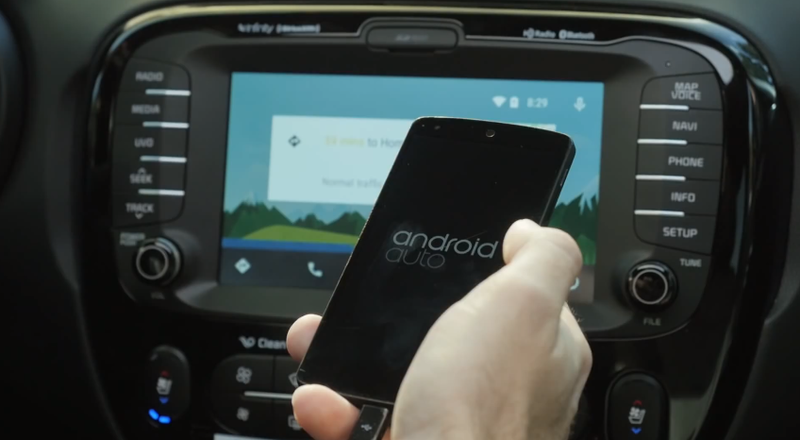 No ETA: No one knows when Android Auto will be available to consumers. The API became available last week to developers for integrating the software into their existing apps or to build new ones. The bigger question remains whether Android Auto will be available in the aftermarket. CarPlay is available through Pioneer and Alpine systems and offer a much cheaper option than having to buy a new car. The Open Automotive Alliance (OAA) which is a collection of companies that will integrate Android Auto, includes aftermarket manufacturers like Pioneer, Alpine, JVC Kenwood, Clarion, Delphi, and Parrot. It might be safe to assume we will see Android Auto in the aftermarket. More info on Android Auto will be available as we near a possible release. According to Hyundai, the technology will be available in a delayed set of 2015 Sonatas sometime next year.